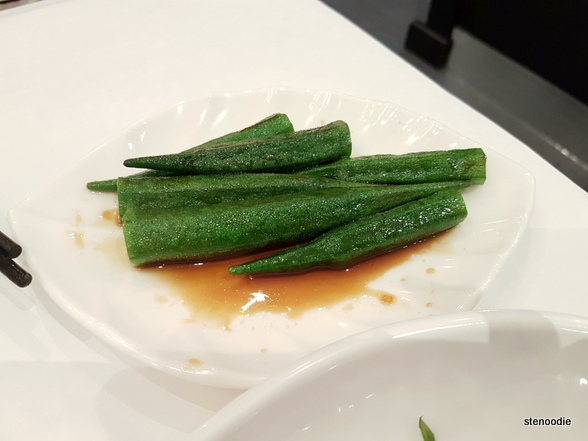 March 29, 2019: This is definitely an all-you-can-eat Japanese restaurant worth checking out! 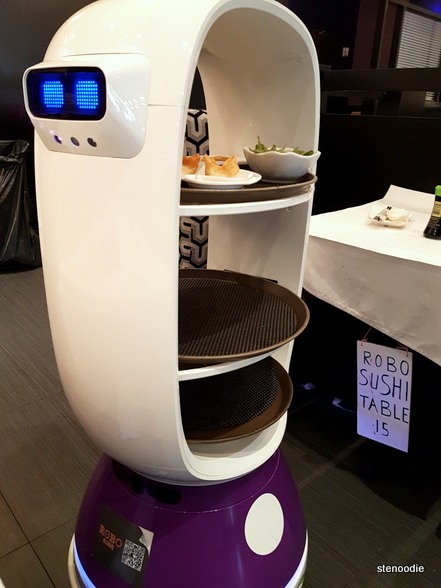 Robo Sushi is a restaurant with robots serving you! It’s an idea straight out of Japan or China where automation for everything is all the rage these days. 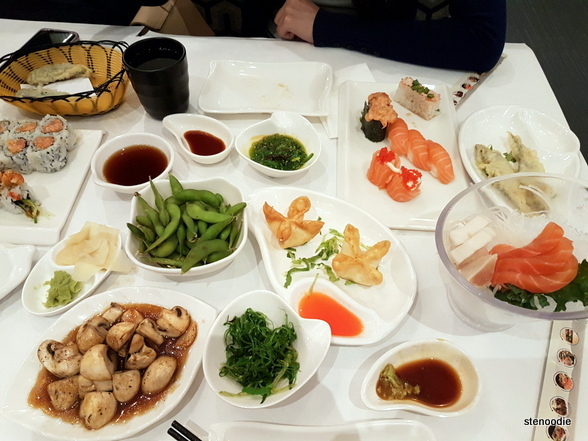 It’s more of a gimmick, but the all sushi and Japanese items that we had during this meal were quite delicious that if you were planning to go to an all-you-can-eat Japanese restaurant anyway, you might as well come to this one to get an extra fun factor from it. 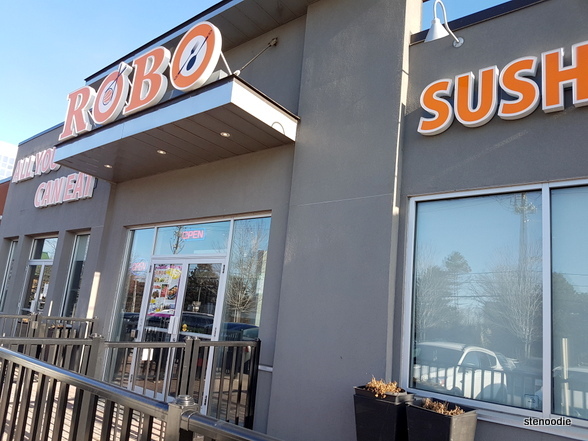 Robo Sushi is located on York Mills Road near Don Mills Road in North York. It’s in a plaza where Dragon Pearl buffet is and also close to Casa Manila. Tracy arrived before me and was already seated inside. When I arrived after finding a spot in their relatively small parking lot (especially so since it’s shared with the other restaurants in the plaza), since I knew she had already arrived, I walked in and past the front desk staff and straight to where she was seated. Immediately when she saw me though, Tracy exclaimed that I should have been led to the table by one of the robots! It was one of the experiences that I had to have since we were here. 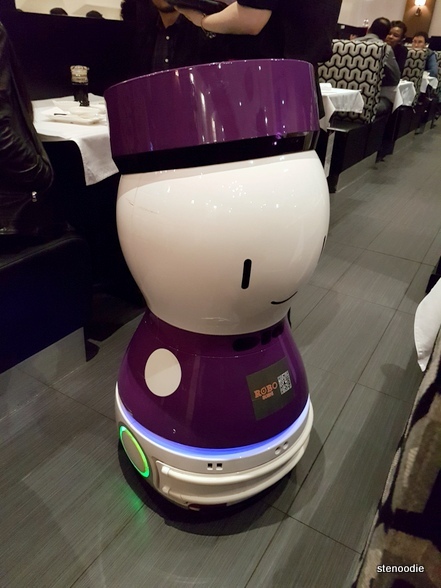 She told me to go back to the front of the restaurant to be led in by a robot. XD I was a bit confused, but I went to the front and didn’t see any robots. 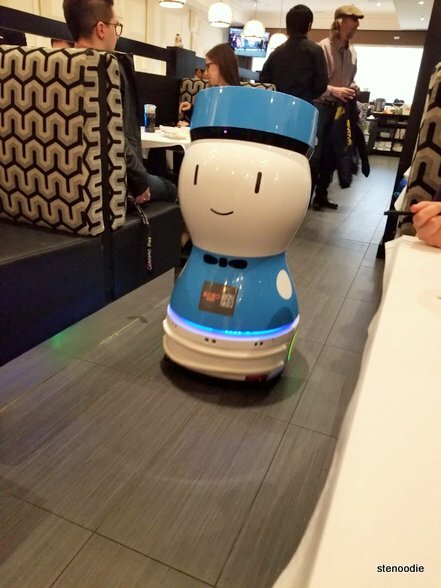 I walked back to our table and said there were no robots there… At this point, one of the (human) servers saw me and asked if I wanted a robot to guide me to my table and I said yes. 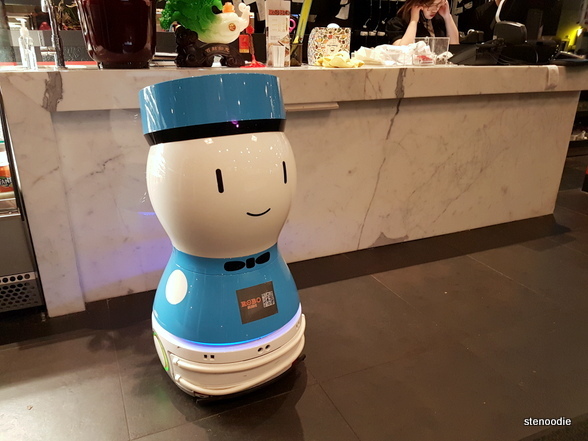 Thus, I followed the human server back to the front of the restaurant where she programmed one of the robots (which had just returned to the waiting area of the restaurant) to our table, #C22. 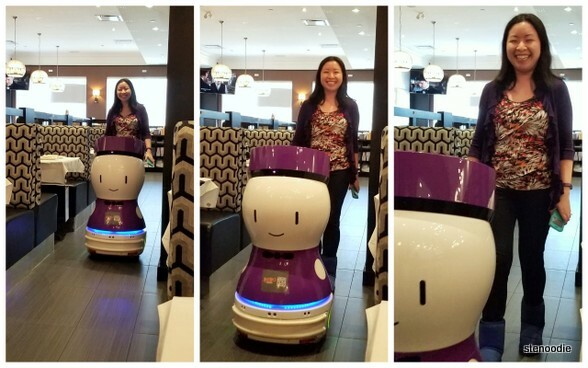 The little robot glided over the restaurant floors and essentially “led” back to my table. It was indeed really cute and unique. XD On the head of the robot, I could see a graphic on the screen that showed a little customer avatar being guided by the robot to their seat. There were some Chinese characters on it too. On our tables were iPads for ordering the food. IPad ordering for these all-you-can-eat restaurants are so common these days and practically all the iPads are the same style. 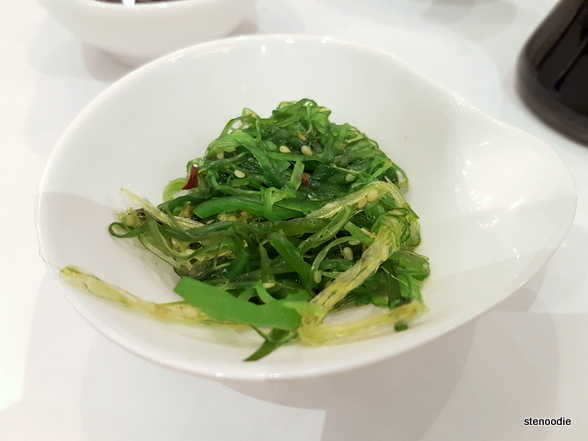 There were a lot of categories of Japanese items including the usual soups, salads, sushi, rolls, handrolls, vegetarian items, and the more special items like sashimi, teppanyaki grilled items, and something especially unique, dim sum! I knew that it was a Friday night and we were there for dinner, but I was still happy to see sashimi on the menu. 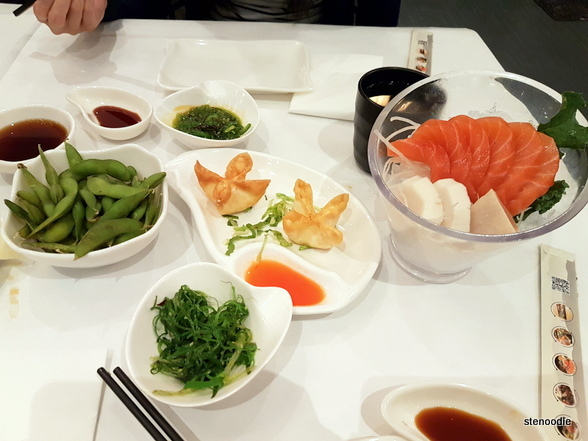 I remember how disappointed I was to arrive at a previous all-you-can-eat Japanese restaurant recently for lunch and how sashimi wasn’t on the lunch menu. Indeed, Robo Sushi had a great selection of foods and lots of variety too. We ordered a bunch of items and very soon after, we had another robot bring the food to our table. 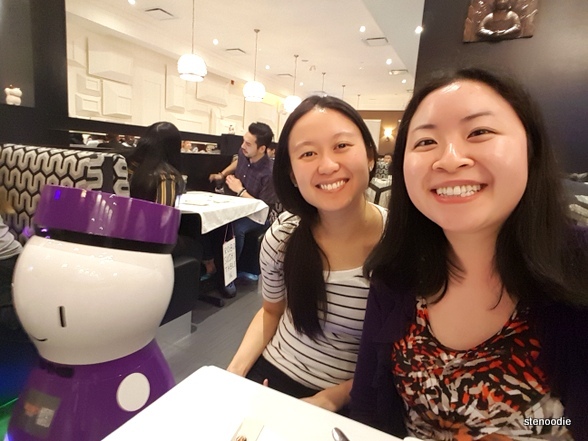 It turns out there are two types of robots at Robo Sushi. One type is the small attendant with a cute face made to act like hosts/hostesses to guide you to your table while the second type are faceless with shelves to deliver food (but they do have two blue lit up eyes on the side, I guess). When this second type of robot brought some of our orders to our table, we took the plates of food from the robot ourselves. 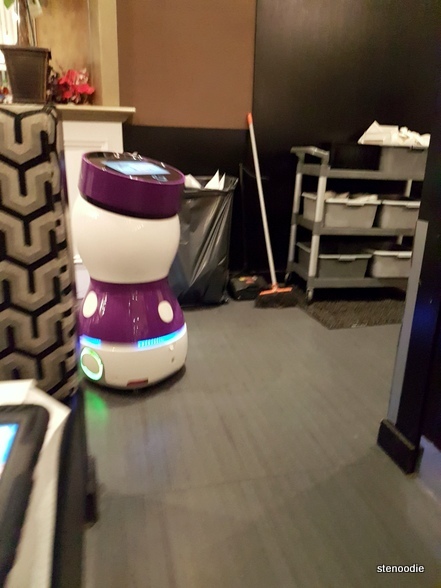 Then an actual human server came around and pressed a button on the robot to send it back to the kitchen. 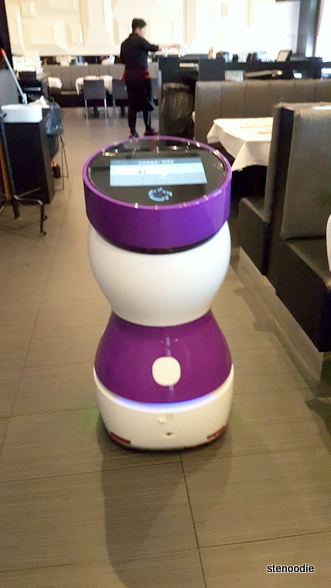 It was pretty cool to see the robot automatically programmed to come to our table to deliver the food. During our meal though, we didn’t have all of our plates delivered this way. We had the majority of our orders brought to us by the actual human servers. It was a cool experience nonetheless. Like I said, the food was really good here considering it was all-you-can-eat. 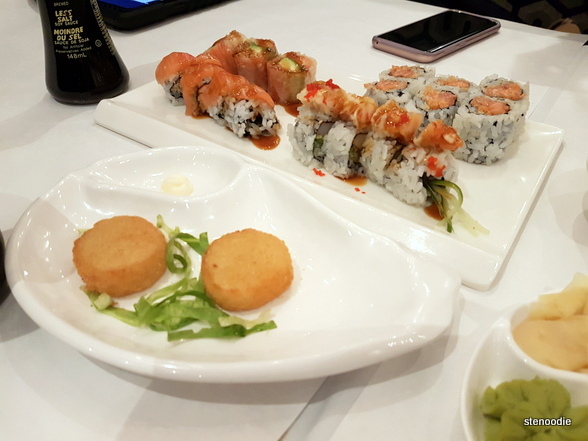 The highlights were the Arctic Rolls, ice cold and smooth salmon sashimi, the fact that they had teriyaki mushroom, deep-fried capelin fish, cheese wontons, and okra! The okra was especially good (a coincidence since I just had some great okra lately too). I didn’t try it, but I liked how their sushi pizza was only two pieces. A lot of times at restaurants, the sushi pizza is made up of more than six pieces, which really fills you up (great for the restaurant but not great for my greedy stomach). They had lot of great dessert selections too. 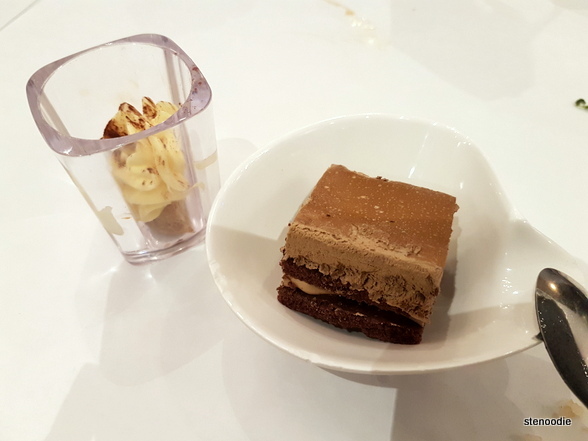 I had the tirasimu in a cup, cake (some type of chocolate mousse) which was good, and fried milk too (it came with chocolate sauce). 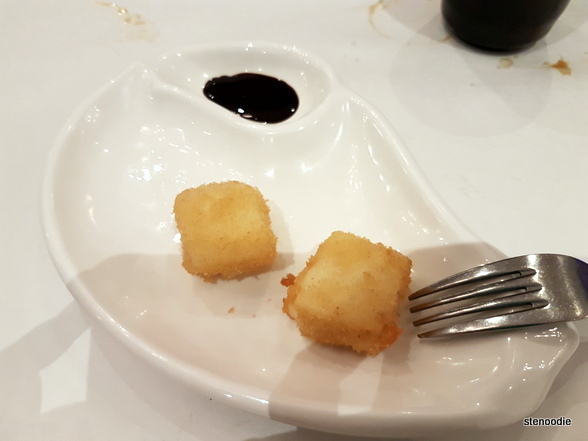 The fried milk was pretty good (I haven’t had this in quite a while). There was no limit on dining time (much appreciated), and we ended up staying for over three hours to eat and catch up. I’m so glad that Tracy suggested this restaurant for us to go to last-minute! Such a fun place for large gatherings or even a date! 😀 I’d definitely return for another meal. 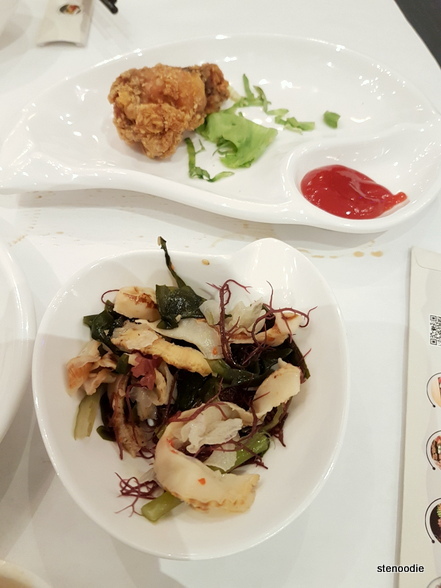 This entry was posted in Food and tagged 865 York Mills Rd Unit #9, all you can eat sushi, cheese wontons, deep-fried capelin fish, food blog, foodie, Fried Milk dessert, fun all you can eat experiences, fun places to eat in Toronto, fun Toronto restaurants, North York, restaurant review, Robo Sushi, Robo Sushi dining experience, Robo Sushi North York, Robo Sushi reviews, Robo Sushi robot servers, robot attendant at sushi restaurant, robot servers in restaurants Toronto, robot sushi restaurant, robots in restaurants, Toronto, Toronto food bloggers, Toronto restaurants. Bookmark the permalink. Omg this is so cute! I love the pics your took of all the little robots haha! And the fried milk sounds pretty delicious.. have to try that! Thank you! 🙂 Hope you have a great time when you go!